Malicious software or "malware" has been around for decades slipping through cracks and wreaking havoc, sometimes just for fun, but usually to commit crimes. 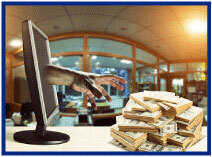 Cybercrime is growing and banks are prime targets since they have large amounts of money to steal. A new hybrid malware called GozNym combines a banking malware called Gozi ISFB and an infiltrator malware called Nymaim which previously had only been used as a ransomware deliverer. This Trojan program (named for the famed Trojan Horse) gains access by tricking the user into downloading it into their network or system. Once inside it works hidden in the background to slowly infiltrate other more secure areas. A few weeks ago GozNym infected and used 22 U.S. and Canadian banks to steal over $4 million from their customer's accounts in just a few days. Fortunately, CyberRisk is one of the coverages offered through Travelers Community Banks program. Don't let the idea of Community Bank coverage make you nervous. 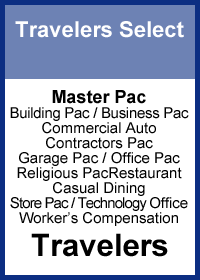 Let the Travelers underwriters be your guide through the process of getting a quote. 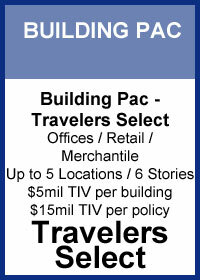 Travelers understands that few agents have extensive knowledge about banks that they have accumulated so they will walk with you through the entire operation, explaining the process and details of coverages. They will even go with you to pitch the coverage to the client. You don't have to fear offering Community Bank coverage. You are not alone because Travelers is with you every step of the way. Slip into Big "I" Markets and take a look at the Community Banks Business Insurance Program, available in all states. 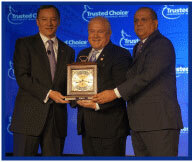 We would like to commend Tom Minkler, CIC, on being awarded the Woodworth Memorial Award, the highest honor the association bestows on one of its members, during the annual Big "I" Legislative Conference. Minkler is president of the Clark-Mortenson Agency in Keene, New Hampshire, and former Big "I" chairman. He was also an early agent adopter of Big "I" Markets, supporting us in our earliest days, and his belief in our concept for a member market access program will always be deeply appreciated by Big "I" Markets staff. We're proud to say that years later, he's still a registered Big "I" Markets agent. Tom was not only an early advocate of providing members with choices for programs on Big "I" Markets. Due to his familiarity with Big "I" Markets, he was an early thought leader on using those same Big "I" Markets systems and assets to help states solve member agency E&O challenges. Many are unaware of this, but the Big "I" Markets infrastructure is an asset well beyond member access to specialty markets, and the single largest product executed on BIM (slightly in the background) is your state staff working with agency professional liability underwriters. The Woodworth Memorial Award recognizes the meritorious and outstanding contributions of an independent agent or broker to the national association, to his or her Big "I" colleagues and to the insurance industry. "The Big 'I' is proud to present Tom Minkler with the Woodworth Memorial Award for his service to our industry and our association," said Randy Lanoix, Big "I" chairman and president of Lanoix Insurance Agency in Lutcher and Brusly, Louisiana. "Tom's dedication to the independent agency community and to his local community fully epitomize the very principles of this prestigious award." To learn more about Minkler's significant accomplishments and contributions to the industry, click here to read the full release from IIABA. Selective is the only insurer that works directly with your national and state independent insurance agency associations to increase flood penetration by member agencies, while coordinating flood advocacy efforts on behalf of insurance agents in congress and with FEMA. Selective has maintained an active presence on Capitol Hill advocating on behalf of the flood program. Selective is a leader in this area and stands side-by-side with IIABA. United, we can help all independent agents speak with a strong voice on the topic of flood. Place more business with Selective's Big "I" endorsed flood program and you can help strengthen that voice! Selective provides you access to a fully empowered and dynamic field model that is ready and able to respond to your needs. Get started today! Contact Selective's internal sales team at floodsales@selective.com or (973) 948-1033, or connect with your flood territory manager at www.iiaba.net/Flood. May 2. "First Monday LIVE!" is a free monthly webcast hosted by the VU's own Bill Wilson and guests on the first Monday of the month to discuss the wide world of insurance from seemingly non-insurance topics. Each 30-minute webisode covers "what's going on" (drones, car sharing, concealed weapon laws, legalized marijuana, legislative issues) and the implications. May topics are pending as information is seen in the news. Click here to learn more and register and here to access the recordings. May 11. "The Dumb Things We Do" " We all can make mistakes in our understanding, advice and actions when it comes to insuring the public. These coverage and procedural mistakes become problematic when they adversely impact consumers and businesses, leading to inadequately covered losses and all too often, litigation. This program taps into a file accumulated by Bill Wilson and David Thompson over the past decade of over 500 real-life incidents that imperiled the financial condition of consumers and businesses. Click here to learn more and to register. Perhaps it's ironic that possibly the largest El Niño event in recorded history appears to be ending and as it does one of the best known Hurricane researches has passed away. 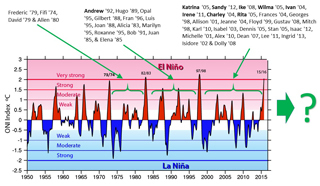 Recently, the National Oceanic and Atmospheric Association (NOAA) predicted "it will soon be time to bid good-bye to the strong El Niño of 2015-2016." Then just this week, Colorado State University's professor Bill Gray passed away. Gray, who was well known for his research in the understanding of what contributed to and, perhaps more importantly, what minimized hurricanes, died at 86. He was well known for CSU's annual predictions of hurricane activity but perhaps most important was his paper discussing wind shear and how it can tamp down hurricanes. So how are these two things related? Well, El Niño is associated with wind shear and that affects the Caribbean and Eastern United States hurricane activity. 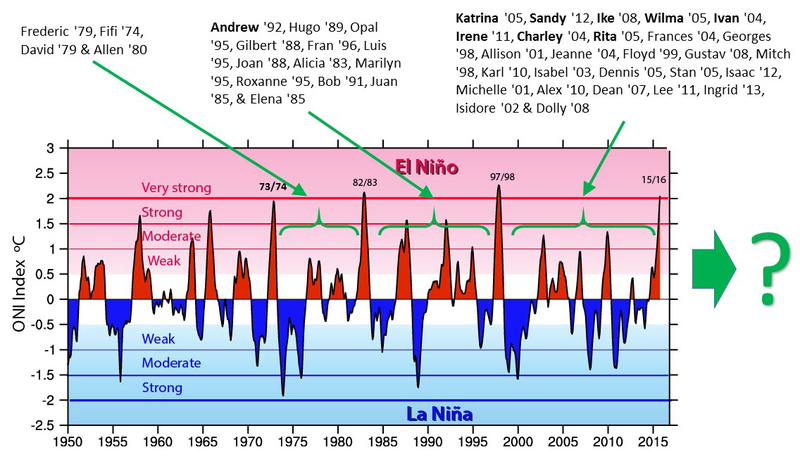 The theory is that as El Niño shifts to La Niña, one can expect more hurricanes due to weak wind shear and trade winds. As Students of the Industry, we knew you would want to know what that looks like. Below is the list of the list of costliest Atlantic hurricanes juxtaposed on a graphic of a widely used El Nino measurement from the National Center for Atmospheric Research (NCAR). The bolded hurricanes listed are the top ten in damages as assembled by Wikipedia. To see the hurricane details search on "Top Costliest Hurricanes Wiki." As for what's to come, that is surely to be debated but CSU's prediction for the 2016 season is 12 named storms, or about average. 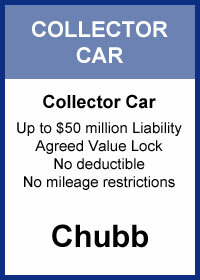 Source: www.climate.gov, Wikipedia, and Insurance Journal. Congratulations to this week's winners - George Goodman (NY), Paula Vigus (MT), Linda Davidson (WA), Wendy Harvey (RI) & Robert McCabe (IA). 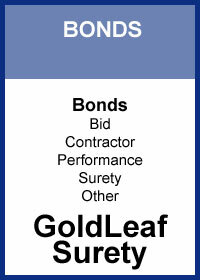 Congratulations to our agent in Georgia on a workers' compensation sale of $16,985 in premium!